While today we may look back nostagically at hand-cranked ice cream, the manual making of ice cream was, in fact, about as commonplace as it is today. Most consumers actually purchased ice cream from confectioners who engaged in making the product during the summer months only. Among local ice cream makers, B. F. Tripp (founded in 1864) was perhaps the best known a century and more ago. The production of ice cream locally was long considered a harbinger of summer, and was eagerly awaited. "The first ice cream of the season was made by B. F. Tripp Thursday," announced the Middleboro Gazette in April, 1875. "Summer is coming." (Only in 1911 did Tripp's begin manufacturing ice cream year round). To meet the demand for this summertime treat, Tripp's was required to make ice cream in volume. To do this, manual cranking would have been inadequate for the needs of the business, so ice cream was made by steam - steam-powered machinery slowly churning the cream. The first Middleborough ice cream makers who resorted to steam appear to have been Robinson Brothers in 1873. "Ice cream by steam is something new for Middleboro, but this is what Robinson Bros., have been doing the past week." Tripp's also resorted to steam-made ice cream and it was probably this firm which manufactured ice cream in a small building on Clifford Street in the rear of the Jenks Machine Shop Building. The operation is depicted upon a Sanborn Company fire insurance map for 1885 as a small one-story wood frame building. Significantly, it was connected with the W. B. Stetson shoe manufactory which occupied the rear of the Jenks Building with leather belting which transferred power from the shoe shop to the ice cream plant. One of the men engaged in the manufacture of ice cream for Tripp was "Muldoon" Smith, a regional roller polo star who, during the off-season, worked in Tripp's ice cream plant. In the early 1900s, many recalled Smith transporting ice cream by the wheel barrow load, undoubtedly up Wareham Street and across the Four Corners to Tripp's ice cream parlor. By 1908 when Tripp's installed an electrically-driven ice cream maker, ice cream making had been relocated to the Tripp store (which also served as the waiting room at Middleborough center for the local trolleys). Since 1892, Tripp's had been located on the west side of Center Street where Kramer Park is now located between the Savings Bank Building and the former Panesis store. Although Tripp's was best known for making candy, it also did a lucrative business during the summer months selling ice cream and to cater to customers, the small Tripp shop included an ice cream parlor which was typically redone each summer prior to the start of the season. At Tripp's, the waiting room, the ice cream room is in order for the opening of the season, tomorrow. It has been painted, re-papered and renovated, and is in spick and span condition. The cream this year is to be of the same high standard and will be made by the latest approved machinery. There will be a large new freezer driven by an electric motor. The arrangement is the first in town, and the freezer will be run directly from the motor by driving gears." Another novelty introduced in 1908 at Tripp's, in addition to the electric freezer, was the "Ice Cream Cornucopia" or ice cream cone which was introduced in Middleborough by Tripp's in July of that year. Mertie Romaine who knew Tripp's first hand, wrote in her History of the Town of Middleboro of the popularity of Tripp's ice cream parlor. "Tripp's ice cream parlor ... was a pleasant 'drop in' for Middleboro shoppers, and evenings after dances were held in the Town Hall or Homestead Hall, the ice cream parlor was filled to overflowing." Demand for ice cream (the making of which was overseen at Tripp's after 1897 by John J. Walsh) could be high, so much so that at least on one occasion Tripp's came close to running out. Had it not been for the quick thinking of Walsh, Tripp's would have undoubtedly seen a run on its establishment. When it comes to lively stunts J. J. Walsh of the B. F. Tripp Co. is taking off the laurels. His ice cream was getting low the other afternoon and in a short while parched tongues would be without the frozen delicacy for a cooler. The populace must be accommodated, so John phoned up to W. R. Perkins in Lakeville at 3.20 that he must have some cream. The cows were contentedly chewing their cuds in the shady spots, little thinking they would be called upon to "step lively" so early. They were driven to the barn, milked, and the milk run through the cream separator, and soon after 4 o'clock it was down in the store waiting for electric power to run the freezer. Very shortly it was dipped out, and business went on uninterrupted. Though Tripp's continued in operation until 1966, ice cream became an increasingly smaller part of the business for a number of reasons. Ice cream parlors eventually fell out of fashion, other local makers such as Farrar's began to compete with Tripp's, and mass produced ice cream came to be available in local supermarkets no longer necessitating an inconvenient side trip. Tripp's Candy Kitchen, published in Mertie E. Romaine, History of the Town of Middleborough. Volume II (Middleborough, MA: Town of Middleborough, 1969), photographic half-tone, c. 1965. The building was occupied by Tripp's following 1892 which remained there until it closed in 1966. 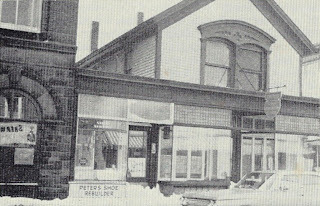 The building was demolished two years later in August, 1968. 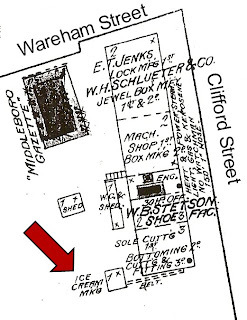 This slightly modifed version of the August, 1885, Sanborn fire insurance map depicts the ice cream-mkaing operation which once stood on Clifford Street and was powered by the steam engine of the W. B. Stetson shoe manufactory. Likely, it was operated by B. F. Tripp. Lucille Bremer as Rose Smith in Vincent Minelli's Meet Me in St. Louis (1944). Rose holds two cartons of ice cream which had it not been for the fortuitious arrival of Colonel Darley "would have been melted." Patrons of Tripp's in Middleboro in 1903 (the year in which the film was largely set) would have faced a similar dilemma in attempting to get their ice cream home in waxed paper cartons before it melted. Consequently, most enjoyed the treat at the ice cream parlor, which explains the popularity of such institutions. Middleboro Gazette, "Middleboro", May 11, 1906, p. 4; ibid., May 22, 1908, p. 4; ibid., June 26, 1908, p. 4; ibid., March 12, 1909, p. 6; ibid., May 22, 1914, p. 5; "What the Gazette Was Saying Fifty Years Ago", May 25, 1923, p. 6; "What the Gazette Was Saying Fifty-Five Years Ago", April 11, 1930, p. 8.